The key to success for most jobs is the ability to work well with others and understand your role in team efforts. The complexities of group interaction can be challenging. 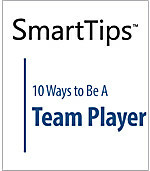 This SmartTips video identifies 10 ways to become a valuable team player and group contributor.